Is your social calendar filling up and your refrigerator door decorated with Save the Date magnets, postcards and invites? When you’re in a certain age it is always wedding season, even during the winter season. Look, I’ll be honest when it is cold my “party clothes” are leggings and boots, maybe a cool sweater… but, when it is someone’s special day it is time to dust off the salt, scrape away the snow and put on your party best. Is your event a refined afternoon, a lovely cocktail party, or a glamorous evening? Either way you’ll want to look your best without completely breaking the bank – you do have wedding gifts to buy, after all. Each set has two outfits with accessories that lend themselves to both. 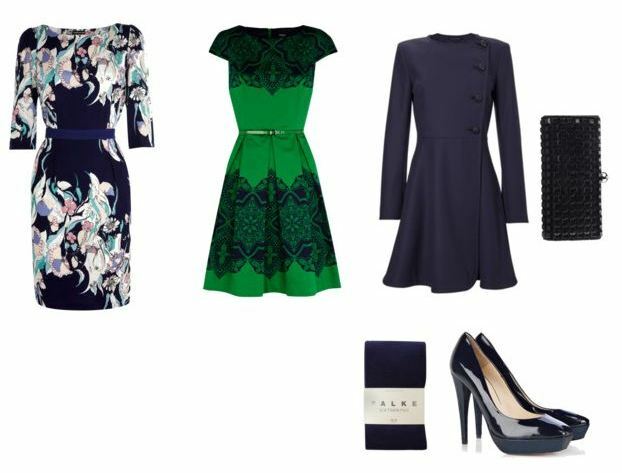 This set with prim dresses, a feminine coat, and thick navy tights are perfect for a winter’s wedding. Luckily both of these dresses with their vibrant prints would transition into the spring season with ease. For a cocktail party soiree mix in some sequins, a more seductive silhouette and playful details like feathers and mixed patterns. The standard trench coat is a sophisticated and every-season topper that plays just as nicely with sequins as it does with denim. 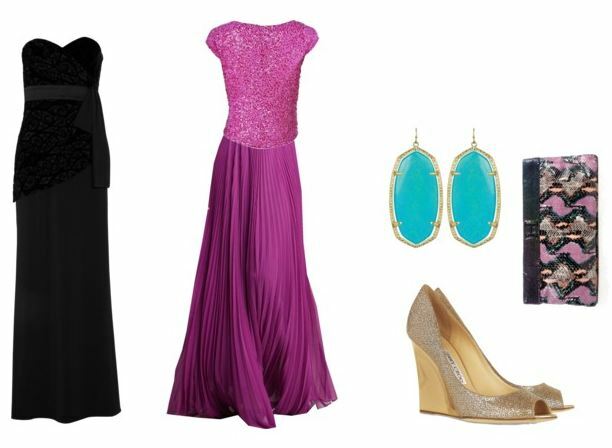 If that invite is ready formal and black tie it is time to pull out the stops, go regal, go glam, go as your most fancy self. Go sleek in black and pair with bold accessories, or bright and playful. With either outfit you cannot go wrong with long and some sparkle. Of course the other must have wedding accessory, a smile and well wishes for the happy couple – and maybe handwarmers in the car! This entry was posted in Her Closet, Her Weddings + Events, Wedding Fashion and tagged cocktail party, what to wear to a wedding, what to wear to a wedding in the winter, winter wedding, winter wedding fashion, winter wedding ideas. Bookmark the permalink. oh my that Tibi dress!!!! !